Hi-Rez Studios has unveiled Paladins: Battlegrounds with new trailer, a battle royale take on their hero-based free-to-play shooter. Without question, the two most popular online shooter franchises right now are Blizzard’s hero-based Overwatch and PUBG Corporation’s battle-royale PlayerUnknown Battlegrounds. But what would happen if you merged the two together? 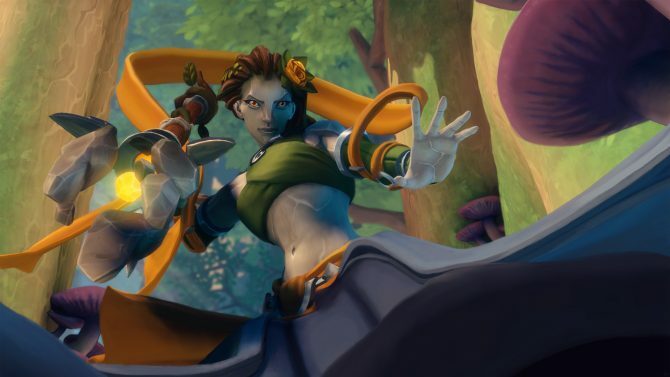 Developer Hi-Rez Studios is looking to answer that question, with the reveal of Paladins: Battlegrounds. Announced today at Hi-Rez Expo 2018, Battlegrounds is a brand new mode added to free-to-play hero-based title, Paladins. Whereas other battle royale games focus on a single-player experience, Paladins: Battlegrounds is instead developed with team-based gameplay in mind. Like other battle royale games, each match will start with a maximum of 100 players in a large map for a maximum time of 20 minutes. As the match moves along, fog will tighten the map forcing players into a central location. Throughout the game, players will be responsible for looting the map and finding supply drops from nearby zeppelins. But where does it differ from other battle royale titles, aside from the team-based focus? According to Hi-Rez, that is where the Paladins component kicks in. Much like the underlying game, Paladins: Battlegrounds will rely on hero powers. A solid team will require having a support character, some defense-based team members, and other heroes in the squad that can unload DPS.